Who misses Hugh Jackman as the Wolverine? I know he hung up the claws earlier this year but he doesn't fail to impress even in a different genre. This man can sing and keep you entertained. Cast: Hugh Jackman, Michelle Williams, Keala Settle, Zac Efron, Zendaya, Rebecca Ferguson, Austyn Johnson, Cameron Seely, Sam Humphrey, and Yahya Abdul-Mateen II. Pros: Hugh Jackman was stupendous as P.T. Barnum. I have never really been fond of musicals and to be honest I never saw Les Miserábles. I may now go back and watch it. Jackman's acting didn't falter and the storyline flowed smoothly between his (Characters) life and those in his entertainment troupe. 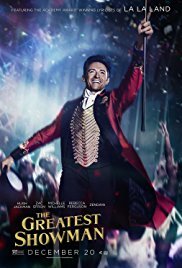 The Greatest Showman's music was very catchy, emotional and each song had significance. Michelle Williams plays Barnum's wife. Her character is a driving force for The Greatest Showman and helps P.T. Barnum through the troubling times. Side characters really fueled the show business especially Keala Settle. The choreography was on point and everything in the background was very catchy. The movie also goes through old life problems of back in the day and they handled it well. Zac Efron and Zendaya, I loved their chemistry and Zac keeps surprising me with his performances. Again, I have to say that I am not fond of musicals but may now change my mind, because although the story could perhaps have gone without the singing it made it more magical and it sucked me right in. The Greatest Showman is a really great family movie that you should definitely catch during this holiday break, it's not one to miss.